Alien Artifacts in our own Solar System? Enrico Fermi was the first to discuss an apparent paradox in the search for extraterrestrials: if intelligent life is likely to exist, then why has no evidence of it been found? One possible answer is that extraterrestrials are concealing their existence from us, an idea known as the zoo hypothesis. The authors of this paper consider this scenario untestable, and instead focus on signatures of alien civilizations in our Solar System that have gone undetected, making it only appear as if extraterrestrials are hiding their existence from us Earthlings. The signatures that the authors focus on are those resulting from remote exploration, such as interstellar probes or non-terrestrial artifacts (NTAs). Are there alien technologies floating undetected through our Solar System? According to the authors of this paper, this question is surprisingly difficult to answer, as the sheer size of space makes a complete search for NTAs nearly impossible. Assuming that an artifact would have a length between 1 and 10 meters, searching the entire Solar System for one NTA is analogous to looking for a needle in a thousand-ton haystack (enough hay to cover an American football field with a layer three feet deep). It is seemingly possible that alien artifacts exist in our own Solar System but remain undetected due to the incomplete nature of human searches to date. Motivated by this fact, the authors attempt to develop a probabilistic framework to compute the likelihood that a given region of space in the Solar System is absent of extraterrestrial technology. The fundamental quantity that the authors calculate is the probability that no NTAs exist in a volume , given that a volume has been searched and found to contain no NTAs. Using Bayes’ theorem, this probability can be expressed as a function of two quantities: the search completeness and the prior odds ratio. The search completeness is given by the ratio . As this ratio approaches unity, the probability that no NTAs exist in the volume also approaches unity. The prior odds ratio, denoted by , is the ratio of the likelihood that NTAs do not exist in the volume to the likelihood that NTAs do exist, i.e. it expresses our prior knowledge of the existence of extraterrestrials in the universe. A low prior odds ratio represents a galaxy where intelligent life is likely, while a high prior odds ratio corresponds to a galaxy in which extraterrestrial life is rare. A value of signifies that the presence of extraterrestrial life in a given volume is neither favored nor disfavored. Since we do not know if our galaxy favors or disfavors the presence of extraterrestrials, is a reasonable choice to describe our prior knowledge (in Bayesian statistics, it is known as a flat prior). The likelihood that no NTAs exist in a given volume is shown as a function of the prior odds ratio and search completeness in the above figure. 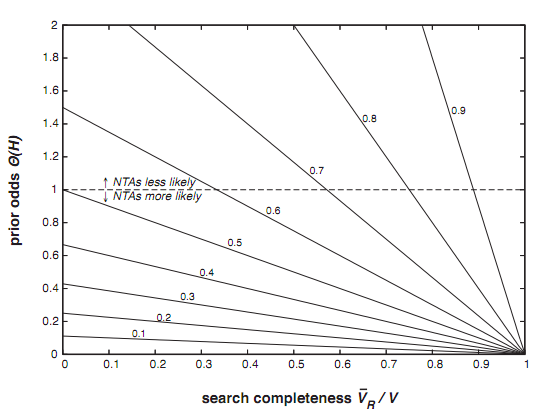 The figure shows that as the search completeness ratio decreases, the probability that NTAs are absent cannot be reasonably constrained, i.e. if we haven’t searched enough of space, we cannot hazard a guess as to whether or not these artifacts exist. The dashed horizontal line in this figure shows where . The authors first apply their probabilistic model to the Earth, the Moon, and Mars. For the case of the Earth, they estimate that the search completeness for NTAs is roughly . When , this corresponds to a probability of or higher that no undiscovered NTAs exist on the Earth. The search completeness for the Moon is estimated to be about , which represents a probability of or lower that the Moon contains no NTAs. Mars is significantly less explored than the Earth and the Moon , and the authors find that there is a probability of about or lower that Mars is absent of NTAs. Lastly, the authors consider the case of the entire Solar System, where they estimate that . Because of this small search completeness, the authors conclude that we cannot rule out the possibility that NTAs are present in our Solar System. In other words, human searches of the Solar System to date are sufficiently incomplete that the presence of extraterrestrial technology cannot be ruled out with any confidence. This conclusion demonstrates that we should be aware of the possibility of finding NTAs in the Solar System as we continue to push the limits of human exploration in the future. Maybe, just maybe, we’ll get lucky and find that needle in a haystack.